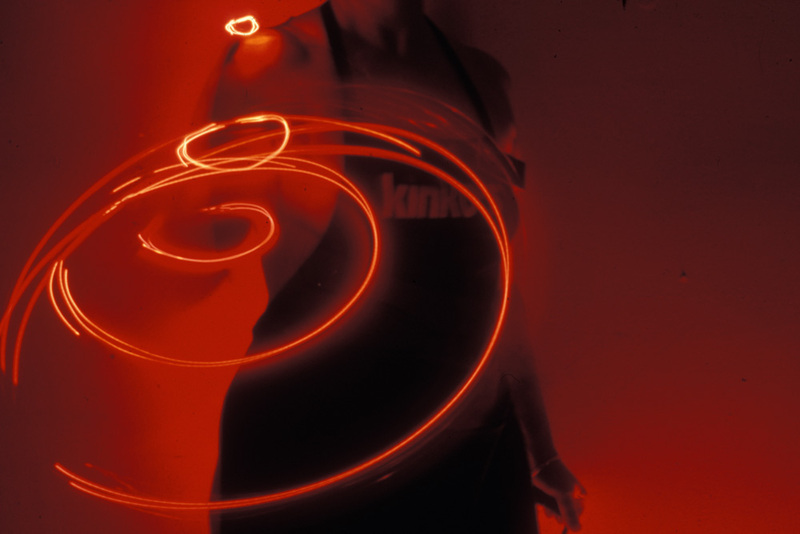 The Light Industry series was made in response to body burnout. 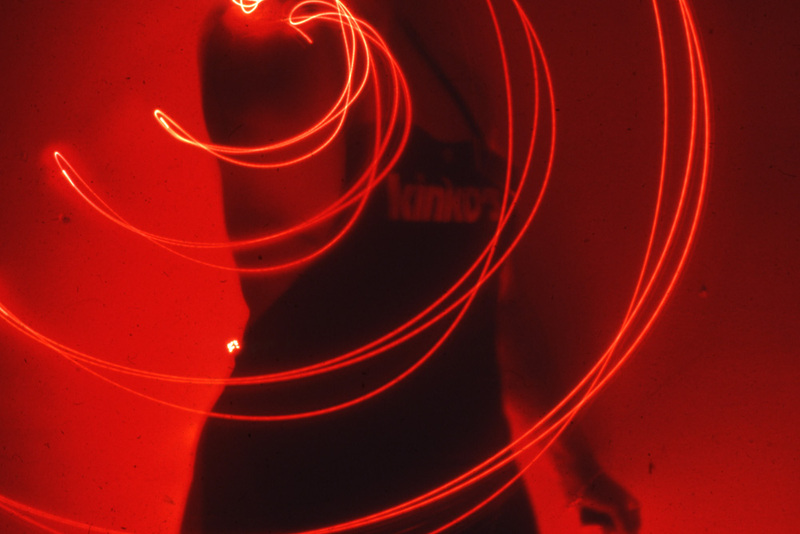 Prior to my time in a Kinko’s apron, I knew nothing of repetitive stress injuries created by constant overuse. By the time I exited the copy business, I was crippled by severe plantar fasciitis from long hours of standing on a cement floor. Ultimately, surgery was the only option for relief. The nerves in my right arm were chronically inflamed, feeling as if a “hot rope” was leading to my neck. Even today, I cannot iron or knit for long periods without a physical reminder of this time. I was mystified that such a short stint in a simple, standing job could result in so much pain. The experience changed my view of workers, in general. I gained new respect for grocery clerks and movers, among others; I regarded my clothing and food with new eyes, acutely aware of the workers who spent long days hunched over sewing machines or picking crops in the fields. Ironically for me, the job that caused so much physical pain was also one of the most pleasurable. I’ve spent some time thinking about the various jobs I’ve had in my life. Of these, only one stands out as maximum fun: Kinko’s. It undoubtedly provided the most laughter, as no matter what shift I worked, humor abounded. Hilarious exchanges sprang from a curious mix of wacky customers and the irreverent interpretations and banter of youthful, fellow workers. I wish everyone could experience this brand of glee, at least once in their working life. 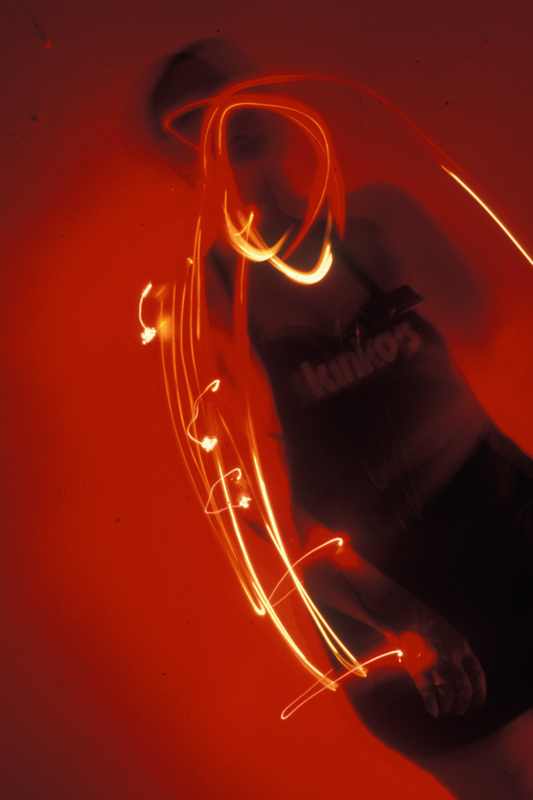 I created the Light Industry series of self-portraits in total darkness with one- and two-second exposures, using low speed positive (slide) film. 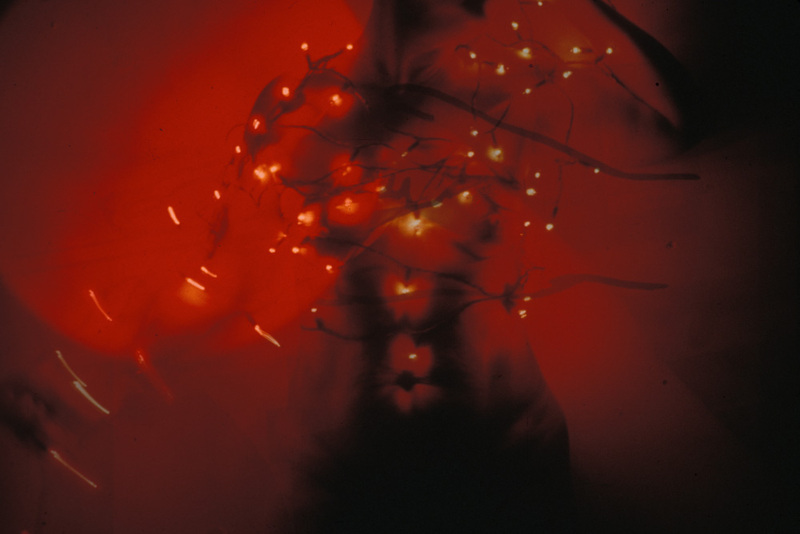 All available light was created by a string of red holiday lights, taped to my back and extending down my arm. In one shot, the viewer can observe the bulb at the end of the shutter release cable. 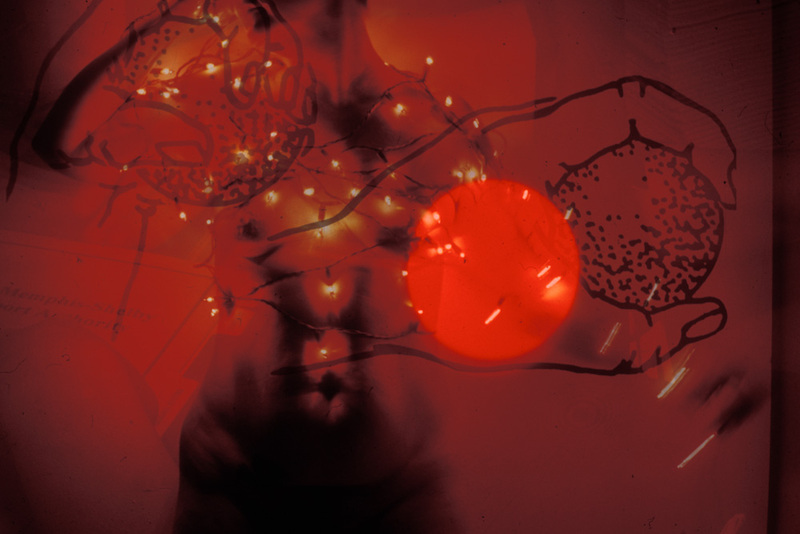 Some of the photos in this series were made by sandwiching my self-portraits with images from medical brochures relating to repetitive stress motion injuries.